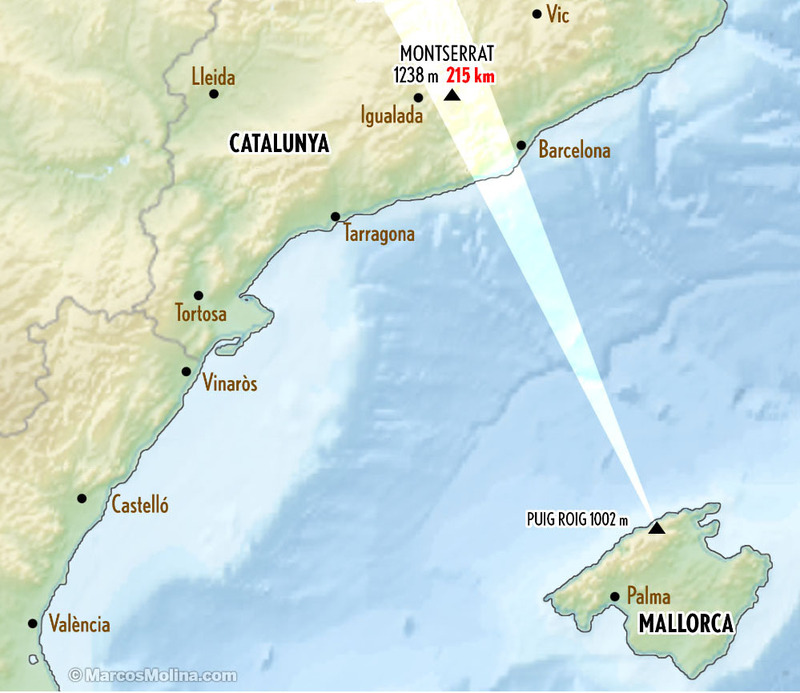 Mallorca – Montserrat | 215 km. Montserrat, the most spiritual mountain of Catalunya, with its unmistakeable jagged silhouette, 35 km. from Barcelona, seen from the island of Mallorca, across the Mediterranean, 215 km. away. View from Puig Roig top (1002m. ), Tramuntana hills, at sunset. This was a totally unexpected spotting of Catalonia’s coast and mountains from the mountains of Mallorca island. In fact, is the most clear observation of this part of Spain’s mainland that I’ve ever had. It was a windy and chilly evening. Wind was coming NW direction, which is usually dry after sweeping the Ebro river basin in the mainland, cleaning the air in the Balearic islands. If you enlarge the picture, you can even notice the antenna at the top of Montserrat mountain. This picture was taken the same day as this & this posts published here. < Previous Canigó – Tête de Chabriere | 381 km. Next > Montseny – Serra de Tramuntana | 239 km.